At the last EGO Conference “English at Play: A Conference on Language and Literature,” a line of questioning came up during my panel concerning the nature of protesting and crisis in America. Some expressed their concerns over the violent nature of protesting that has occurred in the past few years, and asserted that protesting should be nonviolent. One person in particular, whom I will paraphrase, pointed out how they admired when children would say, “I prefer not to” when faced with an unfavorable situation. This “I prefer not to” mentality is often held up as the correct mode of protest. Many Americans today look at the protests following the numerous instances of police officers killing black men and children and demand that protesters find a less violent and less disturbing method of protesting. Unfortunately, this desire for protesting to be a less intrusive and suffocating act in the quotidian lives of the average American fails to comprehend the act of protesting itself and the systemic issues it addresses. The pattern of black adults and children being killed in police encounters has been a huge discussion point in the overall race conversation in the United States. When the riots in Ferguson and Baltimore broke out, many Americans were dismayed that the protesters engaged in activities such as arson and vandalism. Discussion immediately began to revolve around evoking a revisionist fantasy of a civil rights era comprised solely of peaceful, unobtrusive protest in order to employ a rhetoric of respectability politics. Those who retreat from addressing race issues but in a scolding manner ask, “What would MLK do?” demonstrate perhaps one of the most egregious examples of paternalistic hypocrisy in recent memory. Respectability politics demands that marginalized groups stay in line with the dominant culture and express any dissent in a manner approved by the mainstream. This is precisely what the “I prefer not to” mentality pleads for: dissent that is easily assimilated and digested by the people occupying normative positions in society. There is a yearning for some hermetically sealed space where protesters can go and speak out while the rest of society passes comfortably by. During the EGO panel Q&A session, people articulated how they felt suffocated when faced with protests and reminders of violence or inequity. This is a common reaction against marginalized voices forcing themselves to be heard in the register of widely disseminated public discourse—of forcing the rest of society to confront the hideous conditions of the minority experience. There is a conflation of violent force with forcing the majority to face the violence enacted upon the other. Detractors of movements like Black Lives Matter demand that minorities speak in a “respectable” and “calm” fashion. And yet this is precisely what has been done and consistently ignored. Take for example the common rhetorical move of pointing to black-on-black violence as an unaddressed and larger concern whenever the issue of systemic violence enacted upon black bodies by normatively white institutions is brought up. The assumption that black-on-black violence is not addressed in black communities and that we need to point it out for them only demonstrates the complete lack of understanding involved in such discourse. 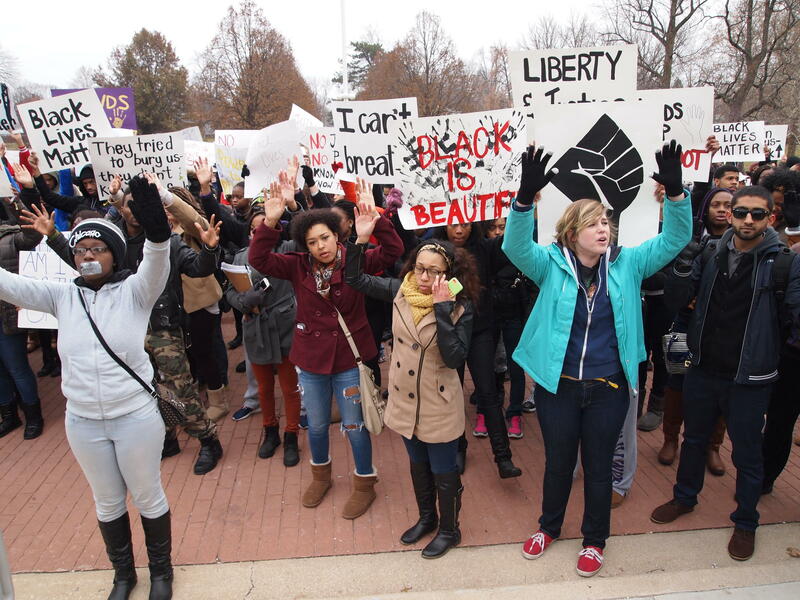 Western Illinois University had its own peaceful protest on December 12, 2014. In an event entitled “WIU Race 4 Justice: Black Lives Matter,” students, faculty, and other community members marched on campus, handed out informational fliers, and voiced their concerns on systemic racial injustice. This event was not sequestered in a remote part of campus or performed during low traffic times to not disturb the everyday lives of passing students and faculty. Rather, it was done in the middle of the day, and marchers were easily seen and heard by anyone passing by. People who complain that protests make getting around and enjoying their day difficult miss the entire point—comfortable normalcy must be disrupted. Minorities are systemically left in a situation where they have to “act out” in order to be heard. People who demand that protesters act in ways that aren’t intrusive or out of line with the mainstream demand the complete abdication of resistance to systemic disparity. Being able to say “I prefer not to” is a privilege; for millions of Americans who have been racially profiled, economically disadvantaged, and juridically criminalized, “I prefer not to” is not a response that affects any change whatsoever. If those of us sequestered in our own fantasies of a nonviolent society in which any address of antagonism can be sublimated into pleasant conversation continue to paternally demand subservience to a system that has already proved that it does not equitably work, then we only obfuscate and detract from the acts of real social change we purportedly support. I love this. It reminds of some of the more blunt and less civil things Bell Hooks has said in interviews like “Feminism isn’t just for whiny white homemakers” etc. My only suggestion would be thus. Could you rewrite this in a less eloquent way? I love your eloquence, but I think that your vocabulary might lose a few people who need to read this. Perhaps a “get out of your polite fantasy world for dummies” version might reach a wider audience. Although, this is for those of us who are in the upper echelons of education who are often the MOST comfortable with our sequestered fantasies.